Equality California sponsored 17 pieces of pro-equality legislation in Sacramento this year, our most ambitious legislative year to in the organization’s history. 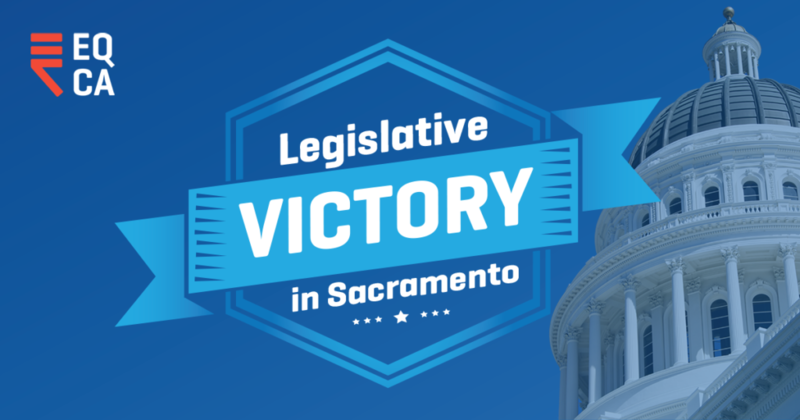 And now that the California Legislature has adjourned and Governor Brown has finished signing bills, we’re proud to report that 10 of our sponsored bills have been signed into law, and all three of our sponsored resolutions have been adopted by the Legislature! We worked hard this year to ensure that transgender and gender nonconforming foster youth will have access to life-saving health care when they need it; that law enforcement officers will receive the tools and training they need to serve and protect our LGBTQ community; and that young people experiencing homelessness — four out of ten of whom are LGBTQ — will have critical resources for housing and services. Our 2018 legislative victories on behalf of California’s LGBTQ community — and the diverse communities to which LGBTQ Californians belong — will also increase access to services for LGBTQ older adults, provide training for teachers and school staff to prevent bullying and harassment and ensure local hate crimes policies are updated regularly. We passed historic resolutions making California the first state in the nation to recognize and affirm the intersex community, increasing awareness of PrEP and PEP — life-saving medication that furthers further HIV prevention efforts — and recognizing both the extraordinary role that LGBTQ parents play in the foster care system and the unique challenges that LGBTQ youth in foster care confront. In addition to these efforts, Equality California worked with the Legislature to secure crucial investments in LGBTQ health and well-being, including $25 million to address youth homelessness, $1.7 million for suicide prevention training in schools, $45,000 to update the state’s model policy on hate crimes and $90.3 million to ensure the 2020 Census fairly and accurately counts Californians. As 2019 quickly approaches, we look forward to building on our success this year — and tackling our unfinished business. For example, Governor Brown vetoed Equality California’s bill that would have given teachers and school staff the tools and training they need — and want — to support their LGBTQ students who may be facing harassment, discrimination or lack of acceptance at school or in their communities. We’re grateful to Governor Brown for being an ally to LGBTQ Californians and a pro-equality champion, but the fact remains that the status quo is failing California’s LGBTQ students and denying too many a shot at success. Equality California is committed to ensuring that every student — regardless of their zip code, race, background, sexual orientation or gender identity — has a safe and supportive learning environment where they can learn and grow. And we look forward to taking a new approach to this issue again in 2019, along with other exciting legislative efforts. Thank you to all our Equality California members and partner organizations who helped us make history this year by calling, emailing and meeting with your legislators. And a huge thank you to the California Legislative LGBT Caucus for your ongoing partnership. Onward!